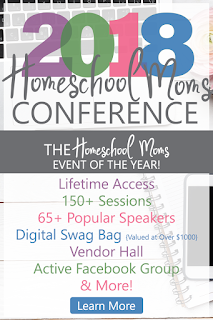 Homeschool Mom Conference - Completely on Line! One of the first things I ever did before I started homeschooling back in 1995 was to attend a homeschool convention. I remember I was 8 months pregnant and my husband could not go with me for the first day of the convention. So I found someone to watch my other two kids and I drove myself two hours away to check in. It was certainly a thrilling time for me. The speakers were inspirational, the vendor hall was overwhelming, and I left with a confidence and enthusiasm for my new life as a homeschool mom. Each convention I attended made my life as a homeschooler so much easier. Some of the speakers were even life-changing for me. But going every year wasn't easy. The conferences were a little expensive and when I factored in gas and food it was more like a null. I also had to purchase recordings of the talks I really liked because they weren't part of the package. Things just got a little easier. 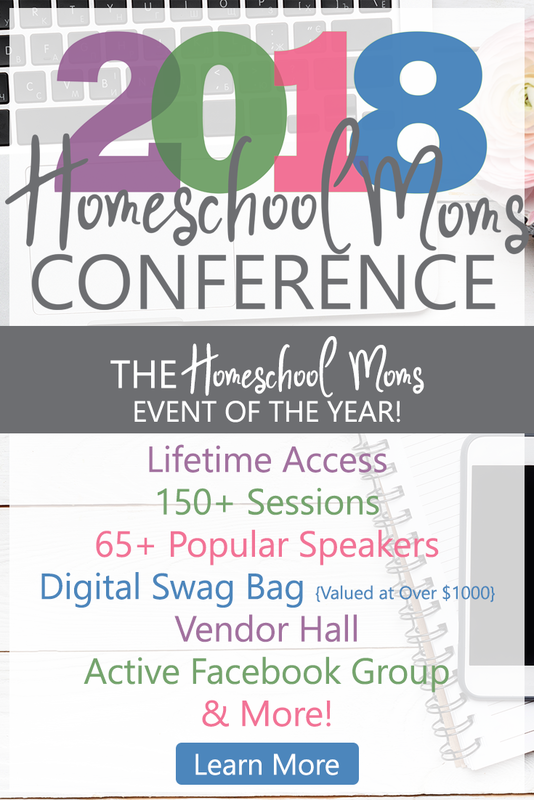 A Homeschool Moms Conference is coming to you, with expert speakers, a vendor hall and a swag bag. And you don't even have to leave your living room! It goes with you where ever you access the internet. The BEST thing you can do for your homeschool is to attend a homeschool conference. The encouragement, practical helps, and advice you receive are instrumental to your success! Now, we're bringing the homeschool conference to YOU! Access over 100 workshops from 60 dynamic speakers and veteran homeschoolers from the comfort of your home. 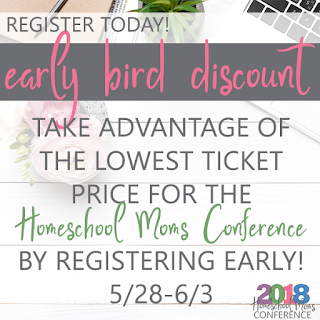 Get your early bird tickets for the 2018 Homeschool Moms Conference now! Need some advice and encouragement from veteran homeschoolers who have been there? 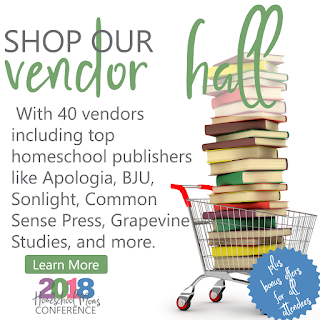 You’ll find all of this and MORE at the 2018 Homeschool Moms Conference! See all the speakers and topics here. I'm especially excited to note that I am one of the speakers this year!! And just like a real-life homeschool convention - this one has a vendor hall too! You won't want to miss this! Here are some more perks! Thinking of working from home! There's a separate section of the conference just for that. Check out those topics here. 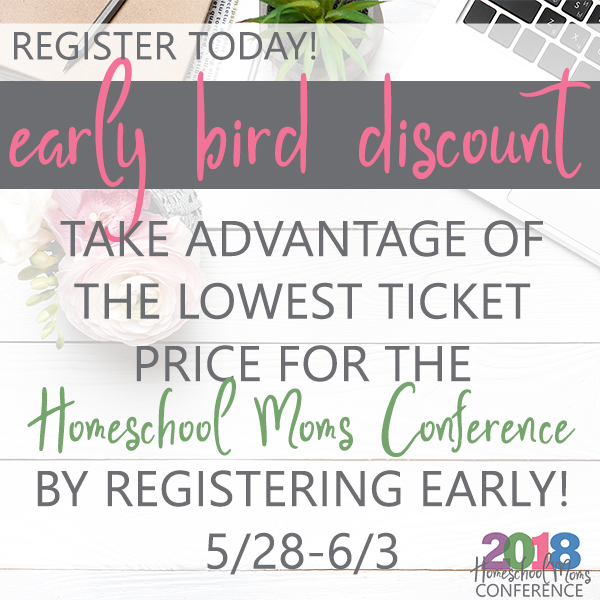 Be sure to get your early bird prices for the 2018 Homeschool Moms Conference now!